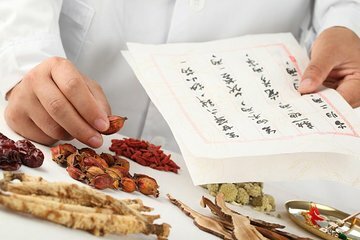 Unveil the secrets of traditional Chinese Medicine (TCM) with a fascinating 2-hour workshop in Shanghai, hosted by a licensed TCM practitioner. Learn about the creative use of everyday foods and herbal medicines; discover the ancient practices of acupuncture and reflexology (foot massage); and enjoy an individual health consultation. This is a private tour for you and your party. The tour says it includes, a selection of Chinese medicinal herbs to take home. Yes, we took some with a surcharge, we also had to pay for the booklets you work with if you want to do so. So bring extra cash or you would not be able to take the class.